Discussion in 'Thumpers' started by Bikedude987, Jan 3, 2018. I’ve had one of these windscreens leading the charge on Katya, my trusty ’14 KTM 450 for about three months now. We’ve slayed singletrack together, climbed mountains, and gobbled up the miles at full chat. 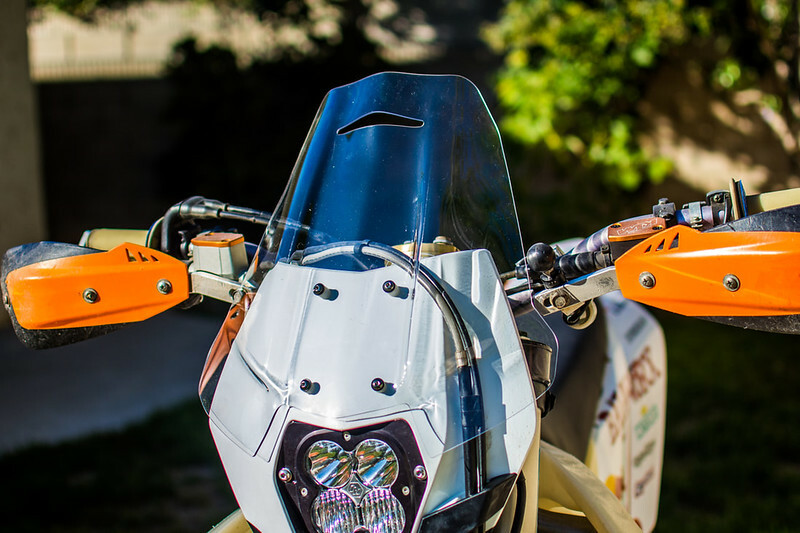 Here’s the low down on the Bajaworx enduro windscreen. A few days after hooking up with the Bajaworx crew, I received a neat, tidy package in the mail. Like the proverbial porridge, the box was not too big, not too small, but juuust right. Maybe it’s just me, but it really irks me when I get a pair of gloves shipped in a box you could live out of. No, Amazon, I did not like your packaging. Tear open the box here, though, and you get a carefully and correctly wrapped screen, complete with a bag of hardware taped in place (nice!) and a clear set of installation and care directions. The screen comes out clean and free from blemishes, and they even used high quality Makrolon polycarbonate in its construction. These guys obviously care about what they make and sell. Next up will have you tearing down your bike (ok just the headlight mask) to install the screen. You’ll have to punch a few holes in the stock shroud, but luckily this part is only about 20 clams if you need to ‘rework’ it for any reason. Removing the headlight assembly is as simple as disconnecting the wiring, removing the brake hose guide, and pulling the two rubber mounting straps. Here’s my first gripe: I’m a klutz and I want a template, darn it! I’m also borderline OCD, so I needed to get it straight. Out come the calipers and the sharpie and I scribe some lines of reasonable accuracy. A paper template that I can lay over the plastic mask and mark out the drill holes would be oh so nice, and save me about 15 minutes of fiddling. Hold your breath, get the drill centered and pull the trigger. If you’re lucky (who needs skill?) you’ll have replaced the sharpie mark with a nice, round hole. If you’re unlucky, you learn that it’s much easier to remove material than it is to add it. I cut it once and it was too short. I cut it again – still too short! One of the more refined features that are included with this piece of kit is the stiffening brackets that help reduce movement of the shield whilst out and about. Sadly, they stopped short of the mark on my particular steed. It should be noted that I’m attempting install on a model year this was NOT designed for, so no fault to Bajaworx. Yet again, the attention to detail surprises me, in this case the appropriate hardware has come pre-assembled; no digging through a bag of hardware looking for the “#4: 6mm screw – 30mm”, or some such nonsense. Just select long or short, and assemble one at a time being careful not to overtighten. Gotcha number 2 – Handguards. No self-respecting offroader would be caught dead without the sturdiest handguards that modern science and manufacturing can provide. Ok, so perhaps I’m being over the top, but in this case I run a set of aluminum guards in a mount of my own creation. This is really a worst case scenario as I’m running the bar all the way forward and I added some extra reach to the guards to clear my controls, so the bars mount extra far forward. A small issue that was solved with some ‘encouragement’ during install. Luckily this was a willing stand-in for the missing braces mentioned earlier and kept the shield very well supported. Ok, enough drivel. We can all find our way around a spanner, and who gives a rat’s arse about the box, right? How’s it ride?! I suppose the answer to that depends on your expectations. It’s a sheet of plastic after all. However, it’s a well designed piece of plastic; not only does this crew care, but they know what they’re doing. There’s a particular rider that this piece caters to, and that’s the rider who is maintaining high speeds over long distances, and who needs to mitigate some fatigue. This shield extends your personal range and increases your comfort. As I mentioned, I took this shield into some properly hairy scenarios, and I never noticed it; with one exception. I bottomed out hard in a G-out and let myself get pulled too far forward over the bars. My chest kissed the top of the shield, but that’s all. No harm, no foul. Otherwise, it’s utterly imperceptible until you get up in speed. Once you’re looking to cover some miles, you will notice well, nothing. And that’s the point. The shield takes all that wind pressure that would normally be pushing you over backwards and diverts it around you. When sitting, you will have practically no wind from the neck down. Unlike other products, this piece accomplishes this in such a way as to maintain smooth, laminar airflow across your helmet. This means that while your head is still in the wind, it’s not bobbling around and creating a roar. There’s some noise for sure, but it’s all quite tolerable. Last but not least is durability. Unfortunately (or fortunately?) I did not get the opportunity to crash test this shield, so I cannot speak to its performance in that arena. I would posit that this screen is the least of your worries in a crash, and that because the headlight assembly is essentially rubber mounted, it would likely survive any encounter with the earth. One area of improvement I would suggest is the brake line routing. The brake hose on my bike would rub constantly on the two ridges on the back of the screen, quickly developing a ‘smeared’ section. It’s a non-issue since the screen in nowhere near your sight line, but it’s kinda ugly nonetheless. Granted, it’s still the best looking plastic on my bike, so who’s to argue? Oceandiving954 and rvsparky like this. I agree 100%. It's the only screen that looks decent on the smaller KTMs IMO. I have no doubt it'd look and work just as good on any bike with a similar number plate inc a 690. Funny you would say this. I had just contacted Bajaworx about fit for a 690.....Anybody try one on a 690 yet? If you look at the way it mounts I don't see how it wouldn't work great on the 690. That's the first bike I thought of when I saw this. The angle of the headlight mask is very similar to the 500 and all it take is 4 bolts. Allowing it to rest against the ends of the hand guards actually helps stabilize it but even if it doesn't rest against the hand guards that doesn't really matter, you can't actually look through it, the windscreen is too low. It does really help with the wind force, on the 500 the air hit just below the helmet and it was smooth air, not turbulent. It does look like it would work. Would you be able to take a measurement for me? Top of light insert to top of screen? Much appreciated? no problem, it's 12 5/8" from that little point at the top of the HL to the top. The screen is pre drilled so those bolt locations are locked in but it obviously could be adjusted upward or downward depending on where you drill the mask. Well, what the hell...looking at this from another computer only one of my pictures worked...lame. Will try to fix tonight. Looks about as effective as the Hardparts 690 touring screens we bolted on headlight shrouds ten years ago. well, cool. Guess I'll leave it then. Are you talking about hitting the shield with your neck or the wind? It gives a nice breeze upward toward into the bottom of the helmet, it's constant and not buffeting. As far as hitting your neck or head, that not an issue under normal circumstances, it's still down pretty far. Didn't give me a problem what so ever and I tested allot harder than I ride dualsporting. I switch back over to another mask if I'm using the bike normally, I use the shield is for long rides where wind protection helps.